Little Boy Blue Bear is sewn from the finest quality alpaca and holds a tiny, handmade sheep puppet. New in 2016, he is a North America Exclusive. Almost every child can recite this famous nursery rhyme, which dates back to the eighteenth century. 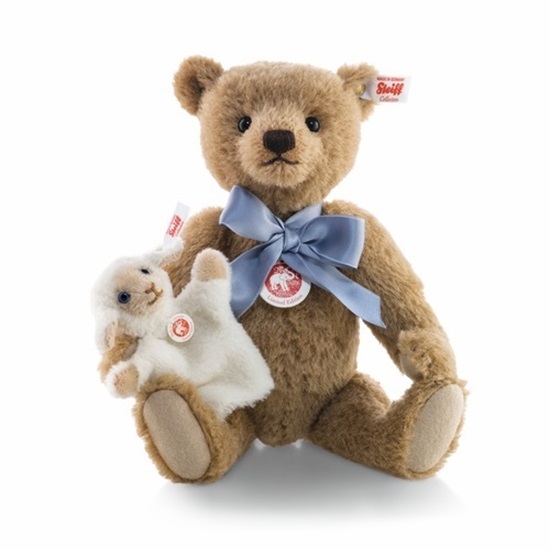 Now Steiff is pleased to present a timeless Teddy bear interpretation of the immortal verse. "Little Boy Blue" is an endearing young boy bear who is sewn from finest quality russet alpaca and holds a tiny, handmade sheep puppet. Around his neck, he wears a satin ribbon that perfectly matches the colors of the sheep’s blue eyes. Both the Teddy and the puppet feature hand-stitched detailing. Ear tag: White tag; gold-plated "Button in Ear"